When there is No Will, an Estate administration attorney can help you obtain Letters of Administration and help ensure the efficient processing of an estate. What is Estate Administration and how can Estate Administration Attorney Help? Who can be the Estate Administrator and How can an Estate Administration Attorney Help? A first cousin can serve as an estate administrator ONLY when all of the cousins on both sides of the family are known and the Court has acquired jurisdiction over all of them. Otherwise, in a cousin’s case, Letters of Administration shall issue to the Public Administrator of the county of Decedent’s death. In some cases, a person separate and apart from the above list can serve as a designated administrator but this can only happen if all of the other interested parties consent to the appointment of the designated person. (There is an interesting anomaly in the law as presently written in that if you die without a Will, all of the next of kin can choose and designate an independent person to serve as an Administrator and there is no additional requirement that the distributees themselves be eligible. Where there is a Will, however, if all of the nominated executors cannot be found or are not qualified, the residuary beneficiaries can choose an independent person to serve as Administrator, c.t.a. only if each of the residuary beneficiaries are themselves eligible. Compare SCPA 1001(6) with SCPA 1418(6).) An estate administration attorney can help you determine who should petition to be the administrator. What is the Role of an Estate Administrator and how can an Estate Administration Attorney Help? Once letters of Administration have issued, the Estate Administrator’s duties parallel the Executor’s duties. The Administrator should find and collect the assets. Any liquid assets should be deposited into an estate account. If there are parcels of real property, then the Administrator needs to determine whether the property should be sold or distributed in kind. The Administrator should wait to see what claims are filed against the estate. Once the assets are collected, the claims and debts are satisfied, then the Administrator can distribute the property in accordance with the intestate distribution schedule set forth in EPTL 4-1.1. I typically recommend that the Administrator create a distribution chart. I also ask that all beneficiaries sign a Receipt Release and Indemnification Agreement before the Administrator turns over the funds so that the Administrator can be protected. How do I become appointed Estate Administrator and do I need an Estate Administration Attorney? First, you must figure out who the Decedent was immediately survived by. The person who immediately survived the Decedent has the first priority to become an Administrator, unless you can find a reason to disqualify them. And, if the Decedent was survived by only one person or by cousins, an Affidavit of Heirship from a disinterested person. Next, fill out the forms. If you are requesting no bond, then an Affidavit to Dispense with the Filing of a Bond. Go to the Surrogate’s Court in the County where you Decedent died or had property to submit all the forms. Go to the Administration Department (because you have do NOT have the will). Submit the forms and pay the fee. If you did not get a waiver and consent from all of your necessary parties, the Court will issue a Citation with a return date. Go to Court on the return date. If nobody objects, the Court will issue letters. If somebody objects, consider calling an attorney. Facts and circumstances may differ in every case. If you have nuances, consider contacting an estate attorney who can help wade through the nuances. Get an estate administration attorney familiar with the local rules in the county where you are seeking to probate/administer. I practice mostly in Brooklyn, Manhattan, and Queens. 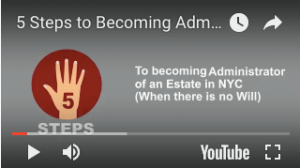 Click here to learn what to do after you have been appointed Estate Administrator. We are committed to expeditiously and efficiently handling your Probate and Estate Administration needs. Please Contact Us to discuss your goals. Serving all of New York City including, but not limited to, the following localities: NYC including New York County (Manhattan); Bronx County; Kings County (Brooklyn); Queens County including Astoria, Bayside, Flushing, Forest Hills, Fresh Meadows, Kew Gardens, Long Island City, Middle Village, Queens Village, Rego Park, Ridgewood, Whitestone, Woodhaven, and Woodside; Richmond County (Staten Island); as well as Nassau County including Garden City, Great Neck, Levittown, New Hyde Park, Syosset, and Westbury; Suffolk County; and Westchester County including New Rochelle and Yonkers. This is Attorney Advertising. The material in this web site is for informational purposes only; visitors should not rely on the information as advice or as a consultation, but should consult a lawyer about their specific legal issues. The content of the site in no way creates an attorney-client relationship. All rights reserved.